High Fibre Breakfast Recipes, Fibre Rich Indian breakfast recipes. High Fibre Breakfast Recipes, Fibre Rich Indian breakfast recipes. Breakfast, as the name suggests is breaking your fast after waking up after long hours of sleep. It is often said that this meal is the most important meal of the day as it boosts our metabolism and provides us with the necessary energy to stay satisfied for longer hours in the later part of the day. Hence this meal needs to be supported with a good amount of nutrition. A good healthy breakfast supplies a balance of carbohydrates, protein and fiber along with small amounts of vitamins and minerals too! Incorporate whole grains, dairy products, sprouts and fruits as a part of breakfast to fulfill this nutritional needs. Jowar and Vegetable Porridge and Broken wheat Upma are a few healthy fiber rich breakfast options in a bowl. In this section you will also find in some other breakfast ideas like Aliv Nutri Paratha, Oats Methi Muthia. You can have oats with almond milk and apples if you are a vegan and also this is a great breakfast option. Lehsuni Bajra aur Kaddu ki Roti uses bajra which is fiber rich and can be paired with curds to make a perfect breakfast combo. Spinach and Paneer paratha or jowar bajra spring onion roti are good options. If you want the classic, then opt for jowar roti or bajra roti and have it with some healthy subzi. And on days when you want to include sprouts in your breakfast, turn to Sprouts Pancake and accompany it with Palak, Kale and Apple Juice. Jowar palak appe makes a great option for fiber rich south Indian breakfast. Or there is oats dosa or oats mutter dosa which is far healthier than regular dosa as there is no usage of rice in this recipe. The healthiest dosa got to be buckwheat dosa which is very high in fiber. What you should definitely avoid is the tasty rava dosa as rava is a refined carb. Check out the nutrients you would gain for each of the breakfast recipes in the Nutritional Table shared with each recipe to be assured of the exact amount of fiber intake for breakfast. Accompany these fiber rich breakfast with a fruit of your choice to add in some more fiber and complete this first meal of the day. Avoid tea and coffee for breakfast, see why? Try and avoid having tea or coffee for breakfast as hinders the absorption of nutrients. So have your coffee or tea one hour before your breakfast or one hour after your breakfast. The objective is to let the digestion take place and the nutrients getting absorbed. 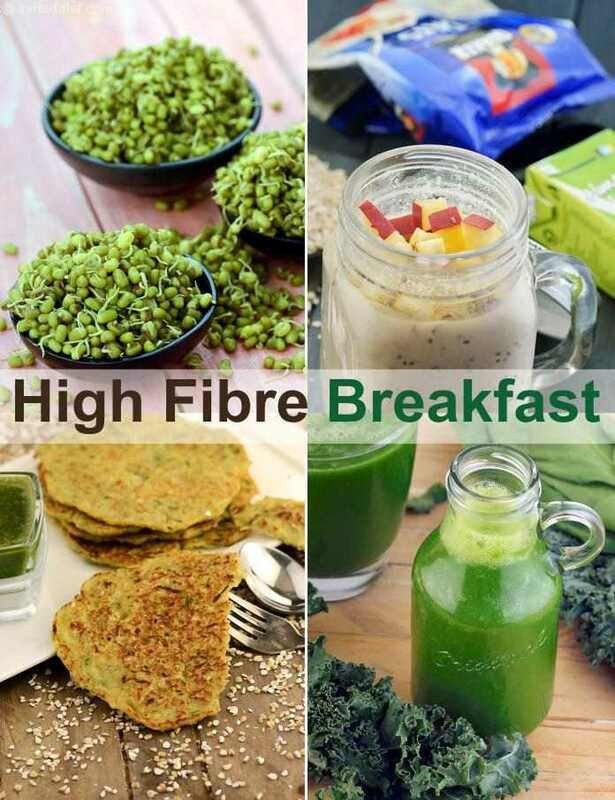 Enjoy our High Fibre Breakfast Recipes, Fibre Rich Indian breakfast recipes and other fiber recipe articles below.